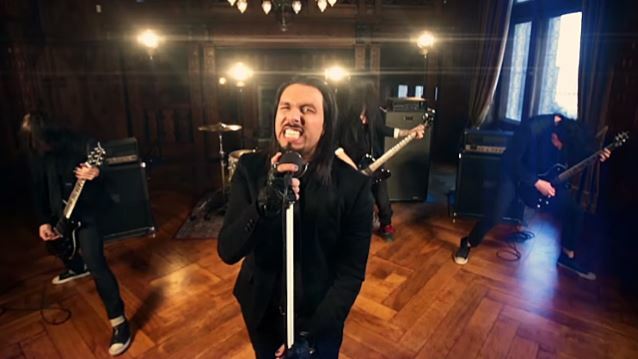 Michigan-based rockers POP EVIL will release their new album, titled "Up", on August 21 via eOne Music. Recorded at Studio Litho, Robert Lang Studios and London Bridge Studios with producer Adam Kasper (PEARL JAM, SOUNDGARDEN, FOO FIGHTERS), the CD is "the sound of a rock band cementing a powerful identity that's steadily materialized over the course of three prior full-length slabs," according to a press release. The first single from "Up", a track called "Footsteps", will arrive at radio on June 1. "People ask me all the time, 'What it's like to hear your song on the radio?' It never gets old!" POP EVIL frontman Leigh Kakaty declares. "It's a reminder of hard work, and of having that dream sitting in your garage, trying to write a song that someone would love one day. That dream happened for our band and it's something that we don't want to take lightly. "Now it's time to step up our game and let people know we can back it all up," he adds. "We want to prove we aren't a one-hit wonder. We didn't just get lucky." "Up" will be the highly anticipated follow-up to POP EVIL's previous LP, "Onyx", which was released in 2013 and has sold 115,000 copies in the U.S. alone. "Onyx" also produced four Top 10 singles on the Active Rock chart, with three of them reaching Number One: "Trenches", "Deal With The Devil" and "Torn To Pieces". Since "Onyx" was released, POP EVIL has played over 250 shows. Rockstar Energy Drink Uproar Festival alongside GODSMACK, supporting STONE SOUR in the U.S. and FIVE FINGER DEATH PUNCH in Europe were just some of the highlights from last year. The band also made headlines with their memorable Rock On The Range festival performance in Columbus, Ohio. Not only did they perform "Trenches" with Rock And Roll Hall Of Fame member Darryl "D.M.C." McDaniels, but the band brought 13 marines on stage showcasing the Lima Company Eyes of Freedom Memorial to stand behind them during the performance. By the time 2014 came to a close, the band found their songs atop the year end charts at Billboard magazine. "Torn To Pieces" landed at #7 on the "Top Mainstream Rock Songs" while POP EVIL came in at #4 on the "Mainstream Rock Artists" chart.